A Code of Conduct for the South China Sea: Effective Tool or Temporary Solution? Suddenly, on March 8, 2017, on the sidelines of China’s parliamentary session, Foreign Minister Wang Yi announced that the first draft of a framework for the code had been reached and “China and ASEAN countries feel satisfied with this.” At the same time, there is a different picture in play outside the negotiating room. 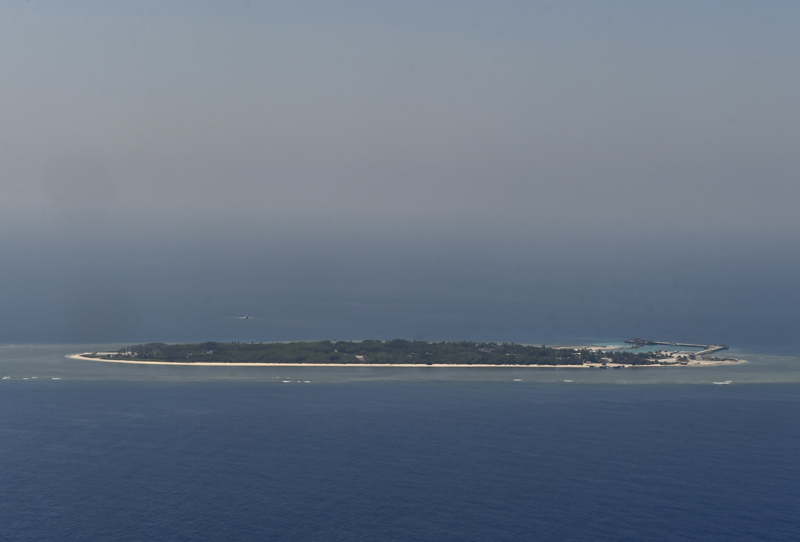 China has continued its actions to affirm its claims over the whole South China Sea. These claims are diverse, ranging from economic (the extension of an annual fishing ban from three to four months) to societal (new cruise tours to the disputed islands) to military (new land reclamation on Tree and North Islands in the Paracels and a foiled attempt to construct an outpost on Scarborough Shoal) to legal (the Chinese Supreme People’s Court statement clarifying the legal basis for the country’s maritime jurisdictions). The appearance of Chinese survey vessels on Benham Rise, on the extended continental shelf of the Philippines, have caused new concerns about Chinese ambitions beyond the South China Sea. 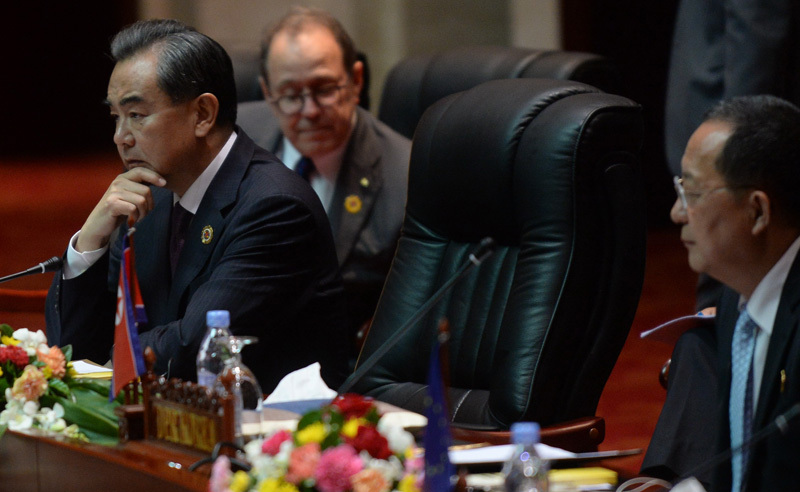 China’s Foreign Minister Wang Yi (L) at the Regional Security Forum on the sidelines of the Association of Southeast Asian Nations annual ministerial meeting in Vientiane on July 26, 2016. HOANG DINH NAM/AFP/Getty Images. The process of creating a binding CoC cannot ignore new developments in the South China Sea. The massive Chinese land-reclamation project and the installation of military equipment on manmade features in the Spratlys are a reality that the DoC was powerless to prevent. The 2016 arbitration award on the interpretation of historic rights and the legal status of features in the Spratlys narrowed the scope of competition for the claimants and interested countries in the South China Sea. New developments in relations among members—such as clashes between Laos and Cambodia over their land boundary, a new round in the dispute between Singapore and Malaysia over ownership of Pedra Blanca, and discord among Mekong River countries over hydroelectric power projects—have all challenged the solidarity of ASEAN. In this context, a framework for a CoC could be a temporary stepping stone from the out-of-date DoC to a final binding CoC, creating a political solution that both ASEAN and China could celebrate in 2017. One of the main priorities of ASEAN is still to finish the CoC, 15 years after the finalization of the DoC and on the occasion of the association’s 50th anniversary. The CoC helps ASEAN reaffirm its central role in maintaining peace and stability in the region through the implementation of international law, especially the United Nations Convention on the Law of the Sea (UNCLOS). This can be realized if the final CoC can incorporate the conclusions of the arbitration award to “move diplomatic engagement forward,” as proposed by a former Philippine foreign minister Albert del Rosario. Unfortunately, ASEAN will likely concede to the demand that the arbitration award be excluded from discussions at the ASEAN Summit, hosted by the Philippines, in order to achieve a much-needed partial victory. ASEAN must also be aware that China will make tactical moves to stall for time, play down the significance of the arbitral ruling, prioritize satisfying domestic nationalism, attempt to secure rules that eliminate interference by outsiders, and complete the militarization of its artificial islands. Nonetheless, China also needs to regain the trust and confidence of ASEAN countries in order to secure their support for its One Belt, One Road program. Given this obvious diversity of purposes, the final general framework for a CoC will likely have few significant differences from the provisions of the DoC. 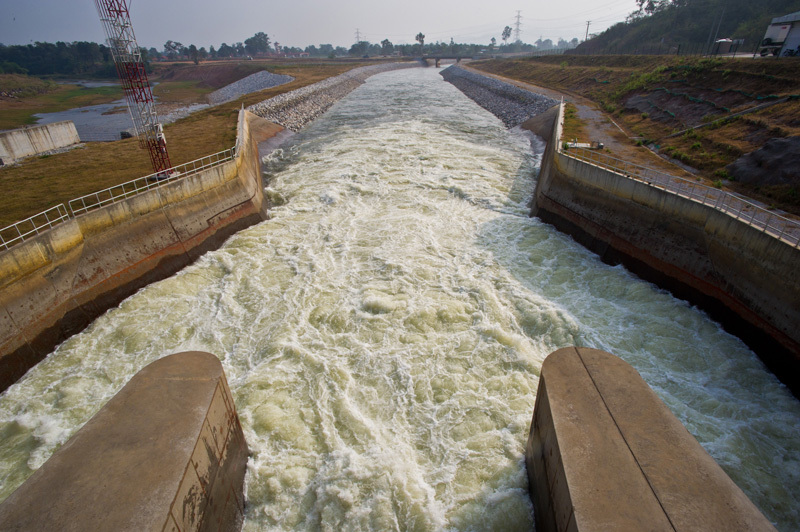 Water flowing out of the reservoir of the Nam Theun 2 Hydroelectric Project in Lao PDR on December 8, 2010. The plant exports power to Thailand, and also supplies electricity for local consumption. Asian Development Bank/Flickr. Taking into consideration the Chinese position that the South China Sea disputes should be settled through bilateral negotiations, a hotly contested question is who will sign the new agreement. Will it be signed by ASEAN and China, or by the latter and each of the ten member countries individually? Beyond such procedural questions, there are at least six substantive issues that must be addressed in the new agreement. China will attempt to reintroduce its favored principles, including those on reasonable expectations in taking account of each claim, consensus through negotiation, elimination of external interference in the South China Sea disputes, and a step-by-step approach dealing with less contentious issues first and territorial sovereignty last. Other principles that might be discussed include marine protection, sustainable development, and cooperation in the semi-enclosed sea. Of course, with chairmanship residing with the Philippines and the existence of an understanding with China, the inclusion of the arbitration award’s conclusions in the CoC is questionable. Second, there is the issue of the scope of the area covered by the CoC. In 2002 the disputed area was vague and ambiguous. Some countries in ASEAN wanted to limit it to the Spratly Islands. Vietnam strongly pushed for inclusion of the Paracels, while China insisted on its claim to the area within the nine-dash line, including all of the Paracels, Scarborough Shoal, and the Spratlys. If the conclusions of the arbitration award are respected, the disputed area other than the Paracels should be reduced to the overlapping territorial seas of features such as Scarborough Shoal and the Spratly Islands. The possible existence of a high seas and seabed belonging to the common heritage of mankind at the center of the South China Sea provides for freedom of the seas and supports the rights of outsiders to the region to participate in the new CoC if the scope of application includes the whole body of water. However, the refusal of China to accept the arbitral ruling will likely translate into an unwillingness to allow outsiders to participate. Its recent fishing ban in waters near the Paracel Islands and Scarborough Shoal, installation of an underwater observation station, and announcement of revisions to the 1984 Maritime Traffic Safety Law to introduce strict restrictions on foreign vessels entering Chinese waters are all evidence that China is maintaining its claim to the waters of the South China Sea without mention of the nine-dash line. Conflicting claims will lead to indeterminacy in the scope of application of the CoC, thereby derailing implementation unless the claimants can adopt a common interpretation. 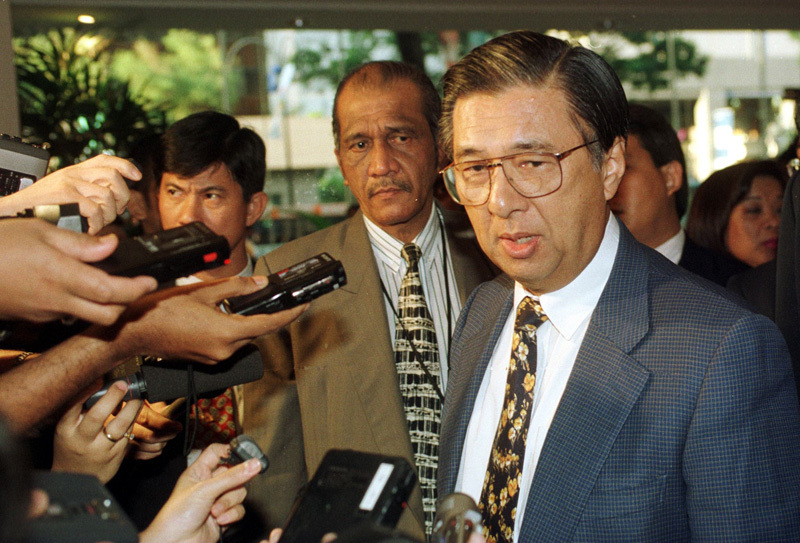 Philippine Foreign Minister Domingo Siazon talks to reporters about sovereignty disputes in the South China Sea and a proposed code of conduct in Singapore on July 21, 1999, at an ASEAN ministerial meeting. ROSLAN RAHMAN/AFP/Getty Images. The third issue is the need for measures to manage escalation of disputes and promote self-restraint. How should parties discourage actions like military exercises, halt new occupation and fortification of claimed features, manage the land reclamation process, decide between acceptance of de facto manmade islands or require their demolition, or distinguish between installations for civil and military purposes? ASEAN and China must formulate guidance on complicated activities that should be banned and subject to self-restraint obligations. These include not only inhabitation of the presently uninhabited islands, reefs, shoals, cays, and other features. Other activities that should be banned or restrained include dangerous intentional maritime collisions; ramming; use of flares, high-powered water cannons, and high-power speakers; sinking of fishing boats; mistreatment of detained fishermen; cable-cutting; seizure of government and private equipment without notification; petroleum tenders on disputed areas of the continental shelf; unilateral movement of oil rigs into another state’s EEZ; unilateral fishing bans; and military exercises near other states’ maritime zones. Fourth, there is the question of binding terms that can ensure self-restraint, the use of confidence-building measures, and cooperation. If the CoC lacks an effective enforcement mechanism, it will follow in the footsteps of the DoC. Projects carried out in less-sensitive fields of cooperation such as environmental protection, scientific research, safety of navigation and communication at sea, and search and rescue operations, as well as the combating of transnational crime, must be put under the power of a common authority. ASEAN and China should set up a permanent organ to implement select projects instead of relying on the discontinuous work of joint working groups. The CoC must formulate the legal grounds for joint development if possible. Fifth, the CoC should include suitable mechanisms for the settlement of disputes, including provisions for hotlines, inquiries, consultations, and other means stipulated by international law. Experience proves that direct hotlines between top leaders of concerned countries can be effective in preventing crashes or hostile actions from escalating. Besides normal diplomatic channels, other tracks should be mobilized. The settlement of the HYSY-981 incident demonstrated the skill of Vietnam and China in using all channels, diplomatic and nondiplomatic, to stop aggravation of the crisis. Itu Aba Island, viewed from a transport plane on March 23, 2016. SAM YEH/AFP/Getty Images. Sixth, there is the question of the participation of relevant countries that enjoy freedom of the seas in the South China Sea. This right is expanded by the arbitration award, which affirms the existence of a high seas and seabed area. Taiwan is an important party, but because of the one-China policy, the island will not be able to join the negotiations, even though it is a claimant. The United States, Japan, and Australia, all important users of sea lanes in the South China Sea, will also not likely be invited to participate. Beijing emphasizes regularly that China and ASEAN have the full capability to resolve disputes among themselves peacefully through dialogue and without the need for any outsider’s involvement. The content of the draft framework of the CoC that China claims is now completed has not been disclosed. However, the new document likely lacks detailed answers to the questions listed above. The framework should be considered a table of contents for a future CoC. Like the DoC, the framework has no binding effect to prevent an escalation of tensions, but it provides a ray of hope. Debate is better than the use of force or militarization. The framework must indicate a deadline for negotiations on the final CoC. Negotiations on the content must be continuous and uninterrupted, as new developments in the South China Sea urgently call for effective self-restraint measures to be put in place as soon as possible. The road to a binding CoC is still long and hard. The CoC will become an academic paper if ASEAN does not demonstrate solidarity in advancing its positions and negotiate as a force comparable to China. Banner Image: © TED ALJIBE/AFP/Getty Images. A fishing vessel anchored on June 16, 2016, at Infanta, Pangasinan province, the Philippines, as its crew prepare for a trip to Scarborough Shoal.